After a long day walking or cycling in the Dales you will be looking forward to soaking your aching limbs in one of our spa baths or enjoying an invigorating shower in your luxurious bathroom. We will make sure your kit is dry for the following morning and have safe storage for your bikes. Using the maps and guidance from the website www.uppernidderdale.org you can plan your walk easily. Have delicious hearty breakfast before you leave and take with you a packed lunch of locally sourced produce that will keep you going all day. We can arrange your transfers to make it easy for you to do the Nidderdale Way while staying at Grassfield Hall every night. 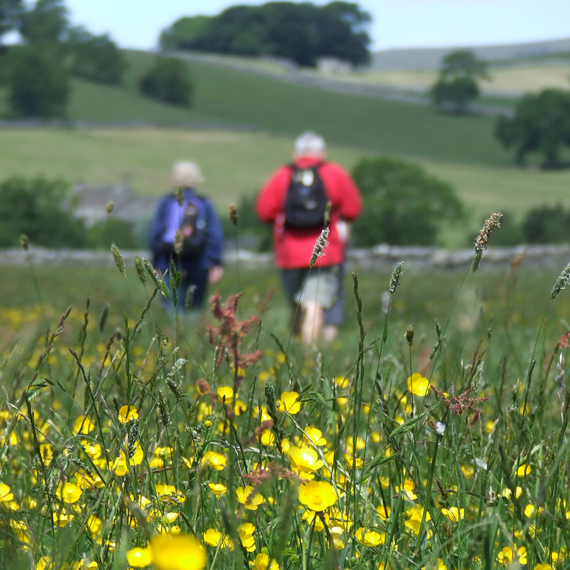 6 to 7 hours of walking per day means that the 53 mile walk is ideally achieved over four days. Starting around 9.30am, stopping to take pictures, look at directions and have your lunch while looking at the incredible scenery, you should finish walking around 5pm each day. Day two: taxi to Middlesmoor - walk to Grassfield Hall. Day four: taxi to Ripley - walk to Grassfield Hall. If you want to make the days longer and complete the walk over 2 or 3 days or just do part of the walk then we can help you arrange this. Why not walk from Grassfield Hall to the Timble Inn, staying one night at both properties. Start your stay at Grassfield Hall, and after a delicious breakfast set off with a packed lunch provided by us and head towards the beautiful Timble Inn at Fewston. After the 12 Mile walk you will be ready for a delicious meal in their restaurant. £130 per night includes breakfast and a packed lunch for the walk.